The hamlet of Orangeburg lies east of Pearl River and west of Piermont in Orangetown. 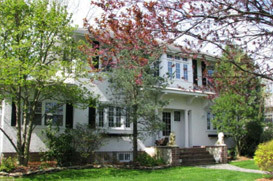 Living in Orangeburg brings you the best school district, South Orangetown Schools, and close proximity to the Palisades Parkway that can get you to New York City in less than 30 minutes. There are plenty of entertainment options in Orangeburg. Blue Hill Golf Course and Broadacres Golf Club make for ample golfing opportunities. For indoor entertainment, there’s the Orangetown Batting Cages and Hudson Valley Puppets, which puts on puppet and mask programs at schools and theaters. For a dose of history, take a trip to the Orangetown Historical Museum and Archives, which catalogues the town’s rich history, and to the Camp Shanks World War II Museum, which focuses on WWII military life. And when you’re looking for some quality eating, there’s a little something for everyone, like Fiesta Mexico, Il Fresco and Thai Garden.